"Beitar Jerusalem" redirects here. For the basketball club, see Beitar Jerusalem B.C. For the women's football club, see Beitar Jerusalem F.C. (women). For the Revisionist Zionist youth movement, see Betar. Beitar Jerusalem Football Club (Hebrew: מועדון כדורגל בית"ר ירושלים‎; Moadon Kaduregel Beitar Yerushalayim), commonly known as Beitar Jerusalem, or simply as Beitar, is an Israeli professional football club based in the city of Jerusalem, that plays in the Israeli Premier League, the top tier in Israeli football. Founded in 1936 by Shmuel Kirschstein and David Horn, who chaired the similarly named Betar branch in Jerusalem. Several team members were also part of the outlawed Irgun and Lehi militias closely associated with the right-wing Revisionist Zionism movement. The club has traditionally worn with kit colours in Yellow-and-Black. The team has played its home matches in the 31,733-capacity Teddy Stadium in the Malha neighborhood in Jerusalem since 1991. Beitar has become a symbol of Israeli football culture and the Zionist movement, and having established itself as one of the major forces in Israel, particularly right wing Likud party. Domestically, Beitar has won the 1986–87, 1992–93, 1996–97, 1997–98 and 2006–07, 2007–08 Israeli Premier League titles, 7 Israeli Cup (1976, 1979, 1985, 1986, 1989, 2008, 2009), and 2 Israeli Supercup (1976, 1986). Beitar Jerusalem was founded in 1936 by Shmuel Kirschstein and David Horn (born 1916) as a youth team. The first games were held against Armenian and Arab teams in Jerusalem, while Hapoel Jerusalem stayed away because of political hate against Beitar Jerusalem. The club was dismantled in 1938 after one of its managers was arrested by the British Mandate authorities and another was shot and injured in another incident. Beitar's troubles were linked to its close connections with the Irgun underground with which David Horn and the club's players were associated. In 1942, the club was reestablished, this time as a club for adults rather than just a youth team, and Shmuel Kirshtein joined the management. Politics again became a problem, with British soldiers and policemen often attending Beitar games to spy and identify the faces of the players. 15 April 1944: Beitar Jerusalem – Plebis 1–1. 22 April 1944: Beitar Jerusalem – Plebis 2–2. 13 May 1944: Beitar Jerusalem – Plebis 3–2. 20 May 1944: Beitar Jerusalem – Allwain 1–3. Later, Beitar Jerusalem qualified for the final, which was to be held against the team of the "Paymasters" of the British mandate. The fans of rival Hapoel Jerusalem caused a sabotage, the games were interfered and the "Jerusalem Cup remained in the hands of the politicians in Tel Aviv", as it was told years later by Shmuel Kirshtein. On 19 October 1944, several club players were among 251 persons who were deported to Eritrea, Kenya and Sudan by the British Mandate Authorities. Among the deportees were David Horn and Rabinovich and some members of Beitar Jerusalem's "First team of 1936." A Beitar Jerusalem team was set up in Gilgil where many deportees played in city-of-origin based teams. A big running away plan was made involving a tunnel dug from the centre of a football pitch in old Gilgil detention camp in Kenya. Two of the deportees were murdered by Sudanese guards for an alleged "escaping attempt". Six succeeded in reaching Europe. All living deportees reached Israel in July 1948. With Shmuel Kirshtein left in Jerusalem, Beitar continued to exist in Jerusalem in its name. When a joint team of Beitar Jerusalem and Beitar Tel Aviv visited Lebanon and Syria, they played one game vs. Homenetmen, an Armenian team which ended in 0–0 and another game against the French Army team which Beitar Jerusalem lost 2–5. Both games were held in Beirut. Another game, planned to be held in Aleppo, but it was cancelled because of a diplomatic incident as Arab delegates in the hotel protested seeing an "Eretz Yisrael" flag, now the Israeli flag, in an Arab country. The British ambassador intervened, suggesting that the Union Jack be raised instead of the "Eretz Yisrael" flag, But head of delegation Hayyim Levin opposed and caused the cancellation of the game. Simon Alfasi, Shimon Stern, Yisrael Yehezqel and goalkeeper Yosef Meyuhas were the Beitar Jerusalem players in the trip. In 1946, Beitar Jerusalem qualified to the 2nd round of the Cup Games against Maccabi Tel Aviv. The scores were a 3–3 and a loss 3–2 in game 2. Simon Alfasi scored all five goals for the club, three in the first and two in the second. On 8 August 1947, all Beitar clubs were banned by the British mandate authorities. The club name was changed to "Nordiah Jerusalem", before a local league was set up in Jerusalem district in November 1947. On 15 November 1947, Beitar as "Nordiah Jerusalem" won the first derby, 3–1 over Hapoel Jerusalem, and on 29 November 1947, a second win was achieved, 8–1 over Degel Zion when one player Simon Alfasi scored six goals in a game, the record for any Beitar Jerusalem's player that stands till today. The club led the league on 29 November 1947, on the same evening when UN GA Resolution 181 was proclaimed, and on 30 November 1947 the games were stopped abruptly: on that day the 1948 Arab–Israeli War broke out. During the war, Beitar Jerusalem player Asher Benjamin was killed by the British when he entered to a British camp in Jerusalem. After independence in 1948, Beitar, again by its original name, played since 1949–50 season in a "Special League" of "Jerusalem's district", ending in 5th place while achieving a win of 8–0 over Hapoel Ramla on 17 December 1949, the highest league win of Beitar Jerusalem in any league the club played. In 1951–52 season, the club integrated into Liga Bet southern part, then the second tier. In 1953–54 the club won the southern division of Liga Bet, and were promoted to the top league, which had just been renamed Liga Leumit. In their first season in the top flight they finished 11th out of 14, and were forced to participate in promotion/relegation play-offs. Although they were the highest-placed club to take part in the play-offs, they finished at the bottom of the group, Beitar were relegated back to the second league, now renamed Liga Alef. In 1957–58 they won Liga Alef, but were not promoted, as there was no promotion or relegation that year. They won Liga Alef again in 1966–68 (a two-year season) and were promoted back to Liga Leumit. That was the best league season ever for Beitar Jerusalem, although it was winning the 2nd division "only". 104 points out of possible 120, for a season of 60 matches when two points were given for winning a match. The club had 32 match undefeated streak with a sequence of 19 wins starting with the 42nd match to the 60th match inclusive, the record of Beitar Jerusalem in any league, scoring 161 league goals. 225,000 spectators saw the club matches in that season. The prize that the club management gave to the players was a trip to the United States of America. After finishing thirteenth in 1968–69, Beitar finished fifth in 1969–70, their best performance to date. In the 1971–72 Liga they finished as runners-up to Maccabi Tel Aviv. In 1974, during a match against Hapoel Petah Tikva, Beitar fans invaded the pitch and attacked Petah Tikva players and fans. This caused the first of several "radius" penalties, in which the club was forced to play matches in other cities behind closed doors. Beitar were also due to be relegated, but were saved by the intervention of Knesset members Ehud Olmert and Yossi Sarid, who forced the suspension of the relegation threat and called for an investigation of Israel Football Association corruption. In 1974–75 the club reached the State Cup final for the first time, but lost 3–1 to Hapoel Kfar Saba. In the same season they finished second bottom of the league, and were due to be relegated to Liga Alef. However, an IFA decision to expand the league from 16 to 18 clubs saw them reprieved. The next season they finished runners-up in the league to Hapoel Be'er Sheva and reached the State Cup final again, this time beating Maccabi Tel Aviv 2–1 to claim their first piece of major silverware, on 16 June 1976, 55,000 or 60,000 spectators saw the game in an overcrowded Ramat-Gan Stadium. Danny Noyman and Uri Malmilian scored for Beitar Jerusalem. [a] On 11 September 1976, the club won the Israeli Super Cup for the first time after beating Hapoel Be'er Sheva 3–2. Uri Malmilian scored two goals and David Yishai scored another goal for Beitar Jerusalem. The club finished as runners-up in 1977–78. In 1978–79, the club ended as runners-up: they also reached the cup final, winning 2–1 against Maccabi Tel Aviv, on 6 June 1979. Danny Noyman and Yossi Avrahami scored for Beitar Jerusalem, to win the State Cup for the 2nd time. Despite the run of success towards the end of the 1970s, the club was dependent mainly on Uri Malmilian's ability. Early in the Season he suffered an awful injury, that made him crippled with the need of three operations until 1981, he missed the most of the games until the summer of 1981. Beitar finished bottom of the division in 1979–80, and were relegated to Liga Artzit. However, they made an immediate return to the top division after finishing as runners-up to Beitar Tel Aviv in their first season back in the second tier. The 1981–82 started with a remembered sports disaster for the club. On 12 September 1981, a referee named Avraham Klein gave a win to Maccabi Tel Aviv in a series of a wrong decisions: Cancelled a goal of Beitar Jerusalem's player Yaron Adiv when he and Beitar's players celebrated the goal, allowing seconds after to Maccabi player Moti Ivanir to score a goal from an offside position. A crowd of 8,000 Beitar Jerusalem's fans went crazy. The Israeli Football Association quickly decided to punish Beitar Jerusalem and discussed the so-called "football game" for six weeks before stating to leave the outcome as 2–1 win to Maccabi Tel Aviv, and filing a reprimand about Avraham Klein. [b] Also the next game of Beitar Jerusalem is remembered: on 19 September 1981, a player of Hapoel Be'er Sheva, Shalom Avitan hit his teammate Eli Vaitzman on his face, and Hapoel Be'er Sheva coach entered the pitch, took Shalom Avitan by his hand out of the pitch and prevented showing a red card by the referee. Beitar Jerusalem won 2–0. Later, with Eli Ohana in his first season, Beitar Jerusalem improved its games, ending the season in the 6th place, and to the delights of its fans, Maccabi Tel Aviv ended that season in the 8th place. The season of 1982–83 is remembered as the "Crazy Season". [c] A bad start of two draws and two losses caused the firing of the coach Eliahu Ofer without stopping his salary payments, and he said "They will ask me to come back". After changing of seven Management members and five coaches, Eliahu Ofer was asked to come back and he came back to be a coach in mid-season, the club was in 16th and last place for two weeks but recovered: from the 18th game to 29th game inclusive, 12 no-lose-sequence of games, Beitar ended the season in the 8th place. This is a place to explain that traditionally as a Beitar movement branch, the club was managed by Heruth and later Likud parties members. Party members were appointed by party apparatus to the party representative football club managers to give them a managing training before they ever venture to carry out political duties. that state lasted until 1999. Some of the managers are ever remembered for good reasons who held Beitar well, such as Reuven Rivlin and his Brother Eliezer Rivlin, but Yossi Zharzhervski left the club after his well remembered brawl with Uri Malmilian when Zharzhevski told Malmilian in the midst of the troubles of 1982–83 season: "I will burn your legs". As a fan said, "Within 3 days Zharzhevski will not be in Beitar", and the fan was proved right. Uri Malmilian was referred by Beitar fans as a saint and was given full support. On the third day Zharzhevski resigned. In 1983–84 Beitar went into the 29th (of 30 games) of the season needing a win or draw[d] to win the title. However, they lost 1–3 to Hapoel Tel Aviv, allowing Maccabi Haifa to win the league, despite Beitar winning the last game 3–2 against Shimshon Tel Aviv, Maccabi Haifa won 1–0 over Maccabi Ramat Amidar and became champions. In 1984–85 Beitar finished again as runner-up, and won the State Cup for the third time, winning 1–0 over Maccabi Haifa on 4 June 1985. Eli Ohana scored, after which coach David Shveizer left. In 1985–86, in the summer of 1985, Dror Kashtan took over as manager. Almost immediately the club won Lilian Cup on 10 September 1985 for the first and only time, after winning all four of its games by an overall scores of 14–2. Asher Sason scored six goals, at least one goal in each game. Beitar Jerusalem finished the league in the 4th place. They retained the cup in 1985–86, beating Shimshon Tel Aviv 2–1, on 27 May 1986. This was the 4th time that the club won the State Cup. Eli Ohana and Uri Malmilian scored for Beitar Jerusalem. On 16 September 1986, Beitar Jerusalem won the Israeli Super Cup for the 2nd time, after winning 2–1 over Hapoel Tel Aviv. Eli Ohana and Uri Malmilian Scored for Beitar Jerusalem. Despite having to play all home matches at Bloomfield Stadium in Tel Aviv, in 1986–87 Beitar claimed their first championship on 2 May 1987, winning the league by a 15-point margin. Both Uri Malmilian and Eli Ohana scored 15 league goals Each. Sammy Malkah scored 13 league goals to make his best season of his career, Gary Van Der Mullen became the ace card and secured eight league points by scoring five league goals in about 17 games, most of them as a substitute. On 3 May 1987 a reporter of Maariv wrote: "I saw the disappointment-full crowds frenzied out of happiness, it is a thing that cannot be described in words." Dror Kashtan's "Coronation Speech" lasted only 36 seconds. Kashtan left the club to manage Maccabi Haifa. Eliahu Ofer became the coach. In 1987–88 Beitar Jerusalem ended in the 9th place, and on the end of the league the club won the Israeli Mini Football championship for the first time on 24 May 1988 after winning over Bnei Yehuda 5–3. That was the first and the last time ever that a nationwide mini football tournament was held in Israel. 24 teams took part. Beitar Jerusalem came to win, and did it. The tournament was held in Malha Stadium in a hall regularly used for Basketball games. Uri Malmilian acted as the owner of the place and was the tournament star. Eliahu Ofer finally won a title with Beitar Jerusalem. Kashtan returned in 1988. In 1988–89 they won the State Cup again. Uri Malmilian scored seven goals on his way to winning the trophy. The club beat Maccabi Haifa 4–3 on penalties after a 3–3 draw on 14 June 1989. Uri Malmilian scored one goal, and Avi Cohen of Jerusalem scored two goals in the game and one goal in the penalties shootout, both in their last game before leaving Beitar Jerusalem. Moshe Ben Harush, Hannan Azulay and Ya'akov Schwartz were the other scorers of the penalties shootout, Beitar Jerusalem players did not miss. Two of Maccabi Haifa players missed. That was the 5th winning of the club in the State Cup Kashtan left the club again during 1989. The 1989–90 was a survival struggle, it became a success by winning the last league game, 3–2 over Maccabi Netanya F.C.. Each of three scorers scored their first and only goal in the whole season. Goram Ajoyev a Tadjik player who came from Russia got sympathy among fans for his games despite scoring only one goal. That goal secured a good end to that season. The Bulgarian Atanas Pashev was the season star. Four league goals made him the top scorer of the club, one-fifth of the 20 league goals that Beitar Jerusalem players scored during that season, but he was attributed that his goals literally saved the club from being relegated. In 1990–91 they finished second bottom of Liga Leumit, and were relegated to Liga Artzit. Under Lufa Kadosh (23 April 1940 – 29 April 2014) the club made an immediate return to the top division. Eli Ohana returned from Europe as ever since regarded as a man who came to save his club. He scored 17 league goals in that season. The club won 1st place in a margin of nine league goals over Hapoel Haifa, both had 60 league points, and both were promoted. Kashtan returned to the club, winning on 1 May 1993, the 2nd time championship in their first season back in Liga Leumit, the club won 22 league games out of 33 setting a winning record in the 1st division and 71 points, also a record during one 1st division league season for Beitar Jerusalem. Eli Ohana and Ronen Harazi where the championship stars. On 16 March 1993, in the State Cup games, the club set its all-time record in any tournament with a 9–0 win over Beitar Ramla. The 1993–94 season ended when the score of the club was 75–66 (+9) but yielded almost nothing positive. Kashtan departed for a fourth time. The coach Amazia Levkovitch came and the season of 1994–95 started bad, he was fired after four games, replaced by Yossi Mizrahi, the club started in the 16th and last place, reached to 1st place and ended in 8th place, meanwhile achieving a win of 8–1 over Maccabi Herzliya on 22 October 1994, the highest win ever of Beitar Jerusalem in the first league games. In Liga Leumit 1995–96 with the appointment of Eli Cohen I, the club had an Improved season ending in the 3rd place. The club won the championship title for the 3rd time in 1996–97 on 17 May 1997. On its way The club gained eight straight wins and after that within the season nine wins in a row. This is a record in Beitar Jerusalem games in the 1st league games. Eli Ohana, Ronen Harazi and Itzik Zohar where the championship stars. at the seasons ended, Eli Cohen said: "Two years in Beitar are equal to five years elsewhere." His contract ended and he left. In 1997–98, Beitar Jerusalem won the Toto Cup for the 1st time on 23 December 1997 by winning 3–1 over Maccabi Tel-Aviv and later in that season won the 4th championship on 9 May 1998, by which time Kashtan had returned to the club again. Despite Itzik Zohar leaving and Eli Ohana suffering an injury in the seventh game without playing until the end, Istvan Pisont led the club to win an achievement only preceded by Maccabi Haifa in 1994. In 1998–99 Beitar reached the cup final, but lost 3–1 on penalties to Hapoel Tel Aviv after a 1–1 draw. Director Moshe Dadash could not carry the club alone. The Involvement of Likud party diminished to that of Ehud Olmert alone. On 6 October 1999 Beitar was sold for the first time to Yaakov Ben Gur. Kashtan was replaced by former player Eli Ohana, under whom the club reached the cup final again the following season, where they lost on penalties to Hapoel Tel Aviv again. Yaakov Ben Gur left over a brawl with Eli Ohana and the team was sold to Gad Zeevi. At the end of the 1990s the club was in severe financial difficulties; chairman Moshe Dadash had sold the club's training grounds and pocketed the money. Gad Zeevi brought the money to buy ten new players in almost unlimited prices and salaries. At the end of the 1999–00 season, Ohana was fired and replaced by Eli Guttman. Guttman started the Ligat Ha'Al 2000–01 well, by 18 games without a loss, and won also the Shalom Cup (Roma) – Peace Cup In Rome on 10 September 2000 when the club beat Alwaqass from Jordan 7–0 in a game which lasted 45 minutes. Later in the same evening Beitar won 1–0 over Roma  in another 45 minutes game, and won its first and only title out of Israel. [e] some days later Beitar lost 1–3 to PAOK in UEFA Cup tournament in Greece. The next game with PAOK ended in 3–3 draw. Moshe Dadash was forced to leave by Israel Football Association over his juristic problems exposed in 2001 concerning the training pitch in Bayit Vegan. The real trouble was exposed by an Israeli court in 2005. Later the season ended in a fiasco, both on the pitch and financially, Guttman became sick and left after 22 league games, and Nissim Bakhar the winner of two titles in 1976 returned, and brought quiet to the team till the season ended. In the later years Eli Guttman and players were accused by fans and media in cheating Gad Zeevi and capitalizing over his expense, concerning the real prices and salaries of some players, especially Branko Savić and Milan Stoyanoski. Gad Zeevi got troubles with Israeli police over Bezeq shares, and found Beitar Jerusalem "Financially Unworthy" and left beitar, applying to a court to declare Beitar's bankruptcy. The club bankruptcy that was declared by a court caused appointing 'Ami Fulman as an interim director by the court until club debts will be settled. 'Ami Fulman and his assistant got a salary of 1 million NIS together and the club was given a budget of 5 million NIS. The previous season players were convinced to get only 25% of their contracted salaries, and whoever agreed about it joined the Creditors Arrangement. The club started to search for players and new owner(s) and fans took active part in it, filling the courtroom in every discussion about the club, and some opened a bank account for donations. Its number was known to few[f] only 54,000 NIS were collected. Beitar Jerusalem was not allowed to play the first three games, they were postponed. The club started to play only from the 4th game onward, losing the 4th, 5th, 6th games, got draws in the next three games and won for the 1st time in club's 7th game vs. Hapoel Rishon LeZion. Meanwhile, New buyers were approved by the court. Meir Panijel, the brothers Meir Levi and Shaul Levi, aided by Sasson Shem Tov. The fans felt that they done the best to help their team. Until the 29th league game, Inclusive, out of 33, Beitar was in 12th and last place, with only five wins and ten draws, 25 points. The 30th game was won, and also the 31st game was won. The 32nd game was a draw 3–3 against Maccabi Kiryat Gat F.C. a rival in the bottom of the league. Beitar Jerusalem promoted itself to the 10th place. The last game was a draw 1–1 vs. the new champion Maccabi Haifa. Beitar ended the season with 7 league wins, 12 draws, 14 losses, 33 points, 39 goals for, 49 goals against, and kept the 10th place and survived in the Israeli Premier League. Manor Hassan scored 11 league goals in his only season as the club player. Beitar scored 15 goals in 3 State Cup games, including away win 7–2 over F.C. Ashdod but lost 0–1 to Maccabi Haifa in the semi-final, on 7 May 2002. The news for the club ahead of 2003-2004 season, came from Maccabi Tel Aviv, the champion of 2002–03 season. On 13 August 2003, three senior club members declared in a press conference: Avi Nimni and Tal Banin are being ousted from the club, because they were blamed in dividing the team as "Making Camps of separate players". Meir Panijel saw the opportunity to take Avi Nimni, the problem was his contract, assumed by millions of NIS. Meir Panijel offered 3 Million NIS. After months of negotiations, en elaborate deal was made. Nimni will get a contract of 4200000 NIS for a 2½ seasons, a part of it will be paid by Maccabi Tel Aviv Nimni Joined With Beitar Jerusalem in mid season, scored eight league goals and Beitar ended the season in the 9th place. Avi Nimni continued to play with the club during 2004–05 season, added 12 more league goals, his charisma helped getting the 4th place. By the end of the season Avi Nimni aggregate score was 20 league goals in 50 league games. During the summer of 2005 it was proven that Meir Panijel, has financial problems. The only worthy thing that remained out of his ownership of the club is the value of the training court in Bayit Vegan. After Spending 60 million NIS in about four years he looked for his way out. The contract of Avi Nimni was a huge burden. Nimni was returned to Maccabi Tel Aviv F.C. by its fans that threw away all three persons that expelled him two years earlier. Panijel got a relief for Beitar Jerusalem finance, 1 year short of Nimni's contract with the club, both separated in good ways. The help to Beitar was unexpected after the 2005–2006 season started. On 18 August 2005, the club was bought by Russian-born billionaire Arcadi Gaydamak for 35500000 NIS without buying of the training court in Bayit Vegan. Ever since Meir panijel leases the training courts to the club for a yearly fee. Arcadi Gaydamak angered some Beitar fans when he donated $400,000 to Bnei Sakhnin in a diplomatic gesture. However, under Gaydamak, the club soon established itself as having the largest budget in Israeli football. Several new players were signed such as Jérôme Leroy, Fabrice Fernandes, David Aganzo and the club eventually signed manager Luis Fernández. Beitar finished 3rd in the league and qualified for the UEFA Cup in 2005–06. Osvaldo Ardiles was appointed manager at the start of the 2006–07 season, but was sacked after disappointing results in the UEFA Cup. His replacement, Yossi Mizrahi, led the club to the title of 5th championship on 7 May 2007, three games ahead of season's end, during a TV news broadcast,[h] when the club got the title ofter Maccabi Tel Aviv was punished by decreasing two league points for a financial fraud involving the contracts of two of its players, increasing the margin of Beitar Jerusalem from 8 to 10 points when three games worth nine points together were left to play. After a crazy celebration made by the fans ahead on the evening of 6 May 2007 after a win against Hapoel Petah Tikva 2–0, because of a rumor that the championship was secured, which was false then. On 8 May 2007, the club player Milovan Mirošević told the press: "It is weird to win the championship without a game." Beitar Jerusalem did the best to win its next game over Hapoel Tel Aviv and won 2–1, to prove to be entitled for the championship on the pitch. In the summer of 2007, Itzhak Shum came to be the club manager. In 2007–08 the club won its first championship and State Cup. Double, winning the championship title on 17 May 2008 by nine points and beating Hapoel Tel Aviv 5–4 on penalties in the cup final after a 0–0 draw, on 13 May 2008 for winning the State cup for the sixth time. The following season, 2008–09 season started when Itzhak Shum as club manager, but bad start to the league and disqualification to UEFA Champions League, Shum was sacked without stopping his wages payments. Reuven Atar came to be the coach. In an improved 1/3 end of the season, Beitar won the State Cup for the 7th time, beating Maccabi Haifa 2–1 in the final on 26 May 2009, despite finishing the game with 10 players vs. 11. Cristian Alvarez and Aviram Baruchyan scored for the club. In July 2009, Guma Aguiar invested over US$4 million and it was widely expected that he would take over ownership of the club, and indeed claimed to be so in December 2009. This was denied by the Israel Football Association, stating that Gaydamak remains the owner due to his ongoing legal issues complicating the sale of the club. Itzhak Shum was returned to work for his contract did not end. On 26 January 2010, Beitar Jerusalem won the Toto Cup for the second time, by winning 1–0 over Hapoel Ra'anana, Idan Vered scored, and the trophy was given along with 1300000 NIS. On the beginning of the tournament Fans told Toto Tamuz: "Please win the cup called after your name" and he became the tournament star when he scored five goals out of the club total 15 goals. The club won seven games, one of them by a technical 3–0, one draw and one loss. Itzhak Shum told the media that he fulfilled his mission: Winning all three titles with Beitar Jerusalem, namely Championship, State Cup and Toto Cup, but he was unfortunate: Many fans claimed his football is "boring" and "sickening" and he had hard times from crowds without honour. He was fired before the season ended with the club ending the league in the 5th place. The club ended the season in financial profit, made by the Toto Cup money. Uri Malmilian started the 2010–11 season as a manager. In Toto Cup games the team started successfully. It passed the group stage without losing, ending 1st place while setting its record score of any time in this tournament. On 9 November 2010 the club won 8–0 vs. F.C. Ashdod, qualified to the quarter-final. In the league games the club had hard times. Uri Malmilian asked to resign, but remained as a manager until after the 18th game Beitar had only 19 points, then he resigned, and was replaced by Ronny Levy. Beitar Jerusalem lost the Toto cup quarter-final to Maccabi Petah Tikva in penalties shootout. In the league the club ended in the 11th place. In July 2011, Beitar Jerusalem announced that a deal was made between club owner Arcadi Gaydamak and American businessmen Dan Adler and Adam Levine who were to take over the club. The deal fell through, when Adler and Levin heard about the club debts, deciding to do not pay them. Since, both were referred by Beitar fans as "Two clowns who came to make an advertising trip on the expense of Beitar Jerusalem." During June 2011, David Amsalem was appointed as a coach, but few days before the league start in August he suddenly resigned a day after the team won 1–0 in a Toto Cup game. Amsalem told that The team is not prepared for the season, without new players he could not be responsible to the future. Yuval Naim replaced him. An Unsuccessful start caused an end to his job when the club was close to the league's bottom. Eli Cohen I, the winner of 1997 championship came. He won the title "Coach of the season" because of a sequence of 8 Beitar Jerusalem's league wins during his period. Beitar finished the season in the 9th place. On 17 June 2012, Gaydamak announced his decision to give up the ownership of Beitar Jerusalem, he sent a letter to the media, in which he specified the titles won by the club in his period, and the total sum of money that he invested in the club, by then: 378,886,000 NIS. On 20 June 2013, the team was bought by Eli Tabib. The deal was confirmed on 2 July 2013. 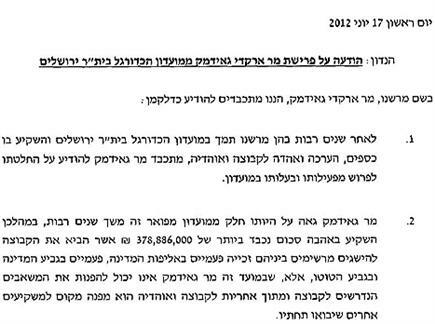 Eli Tabib took the responsibility to pay Beitar Jerusalem FC debts, totaled by 12.5 Million NIS. The media reported that he paid most of them during August 2013. After 6 years in office, Tabib removed Itzik Korenfein from the position of Club chairman. Before the beginning of 2013/14 season, Eli Cohen II was appointed as Head Coach until December 2013. Ronny Levy replaced Cohen, but the club failed to improve in its achievements. In April 2014 Menachem Koretski become the new coach until January 2015. Koretski was replaced by Guy Levy who led the club into the fourth place in the Championship table standings. For the first time since 2007, Beitar returned to European tournaments to compete in the European League. In June 2015 Slobodan Drapić became the new coach. During the Europa League second qualifying round first leg at Sporting Charleroi, the game between Beitar and FC Charleroi was delayed for three minutes due to the unruly behavior of some Israeli supporters. The club suffered a heavy loss in Charleroi (5–1) and the owner Eli Tabib announced he would leave the club. At the end of 2015–16 season, Beitar finished in the 3rd place in IPL and qualified for the Europa League first qualifying round. Slobodan Drapić Left the club due to his contract ended and Ran Ben Shimon was appointed as the new manager. Beitar signed new players as: Idan Vered, Marcel Heister and Erik Sabo. At the end of 2017–18 season, Beitar finished in the 3rd place in IPL and reach the Israeli cup final, but lost the title to Hapoel Haifa. Beitar Jerusalem scored at least one goal in each and every one of 36 league games in 2017-18 season, continuing scoring since the last 6 league games in 2016–17 season since April 22, 2017 making a record of 42 consecutive league games that Beitar Jerusalem scored, the historical record for the Israeli football ever. beitar sored 75 league goals in that season, even its record score in 1993–94 season. On Monday, August 13, 2018, Beitar was Jerusalem was sold to Moshe Hogeg for 26.5 million NIS, of which where 18 million NIS to Eli Tabib and 8.5 million NIS for debts payments and avoiding lawsuits. During that week Israeli defender Tal Ben Haim joined with the club. The Menorah is the emblem of Israel and the logo of the early Revisionist Zionist movement Betar. Teddy Stadium, Beitar's home ground. The club was initially based at the "Banana Field" close to Beitar youth group's "nest", but by the 1950s they had moved to the YMCA Stadium, which was later shared with Hapoel Jerusalem. The YMCA was nicknamed "the sandbox" due to the poor condition of the pitch. In 1991, both clubs moved to the Teddy Stadium, named after longtime Jerusalem mayor Teddy Kollek. Initially the stadium was two-sided and held 12,000 spectators. This was increased to 21,600 when a third side was completed in 1997. The fourth side of the stadium was completed in the summer of 2013 in anticipation of the UEFA under 21 championship hosted by Israel, increasing the capacity of the stadium to 31,733 seats. The ground has been dubbed Gehinom (lit. Hell) by club supporters, for the hostile atmosphere it presents to visiting teams and their fans. The most vocal supporters of Beitar Jerusalem make up the controversial nationalist La Familia group. These fans are well known for their hatred of Arabs and their pride in the fact that Beitar Jerusalem is the only team in the IPL that has never had an Arab player, even though it had several non-Arab players of the Islamic faith. Fans in and out of the stadium's stands chant anti-Arab and racist slogans. The club has also been penalized many times for the behavior of its fans. Although Beitar Jerusalem has yet to have an Arab player, team leaders say that they would welcome an Arab player when the right conditions make it possible. Goram Ajoyev, a Tajik player, was the first Muslim to ever play for Beitar Jerusalem. During the hardship season of the 1989–90, his religion went unnoticed by most fans. Ajoyev was well liked by Beitar fans due to his all-out efforts during 13 games of the season's second half. Ajoyev's single goal in the last game, a 3–2 Beitar win over Maccabi Netanya, helped the club secure a berth the following season in Liga Leumit, the top league in Israel at the time. Viktor Paço, an Albanian player, was a star for Beitar Jerusalem. He scored 21 league goals in 67 games and at least 2 State Cup goals during 2 non-consecutive seasons: 1999–00 and 2001–02. In an interview to the Jerusalem newspaper "Kol Ha'Ir", he stated that he is a Muslim, a fact that was later mentioned in the Israeli media. Another of Beitar fans' favourites was Viktor Pacha. Nigerian player Ndala Ibrahim, a Muslim, was on the team briefly in 2005 on loan from Maccabi Tel-Aviv, played 4 games, supported by coach Eli Ohana but left after being mobbed by Beitar fans. He returned to Maccabi Tel Aviv and soon returned to Nigeria. In 2013 the team signed two Chechen Muslim players, Zaur Sadayev and Dzhabrail Kadiyev. When fans protested, Israeli Deputy Prime Minister Moshe Yaalon condemned the protest as shocking and racist, stating "I was shocked by the racism displayed in the Beitar Jerusalem stands yesterday against having Muslim or Arab players on the team". Fans of the club reportedly displayed a banner bearing the words "Beitar – forever pure" and chanted anti-Arab slogans at a match the day the players were signed, leading to four arrests. On 8 February 2013, 2 fans, Matan Navon and Evyatar Yosef set fire to the club's administrative offices, apparently in response to the signing of Sadayev and Kadiyev. Prime Minister Benjamin Netanyahu, who is a Beitar supporter (along with many other senior Likud politicians), condemned the arson as "shameful" and "racist". On 3 March, Sadayev scored his first goal for Beitar during a league game against Maccabi Netanya, prompting hundreds of the team's fans to leave the stadium. A documentary titled Forever Pure captures Sadayev and Kadiyev's journey and the reception of their teammates and the Beitar fans. Beitar's first competitive European match was a 1-1 draw with FC Zimbru Chişinău in the 1993-94 UEFA Champions League. The team has participated in the UEFA Champions League five times, never advancing farther than the second qualifying round. Most League goals scored in a season (IPL): 75 goals in the 1993–94, 2017-18 seasons. 161 goals in a double-season of 1966-68 in "league A", then the second league. Longest sequence of scoring in each league games (IPL): 43, since the last 6 games of 2017-18 on 22/4/2018 continuing as long as the whole 36 league games of 2017-18, and the 1st game of 2018-19, on 27/8/2018. Only up to six non-Israeli nationals can be in an Israeli club squad. Those with Jewish ancestry, married to an Israeli, or who have played in Israel for an extended period of time can claim a passport or permanent residency which would allow them to play with Israeli status. ^ The final was not televised, because the shirts of Maccabi Tel Aviv players bore a sponsor commercial. It was prohibited to show commercials in a state run TV then, the law about it was changed later to allow broadcasting advertisements. ^ Avraham Klein was not a referee in Beitar's games ever again. On 27 May 1986, Israeli Football Association planned to give him an award when he retired on occasion of State Cup final, but 16,000 Beitar Jerusalem fans where there escorting the team, among them were the writer of those lines and his brother. Klein did not show up, knowing about the song of curses heard by Beitar's fans since 12 September 1981 against Avraham Klein, and fearing the Beitar fans' reaction. The prize of Israeli Football Association was given to Klein privately. In 2000, 19 years after the troubled game, Yossi Mizrahi was asked about the game and said he forgave Klein. Also Ivanir memorized his goal. Klein defended his decision to disallow Yaron Adiv's goal, but years later in his autobiography he apologized for not stopping the game before Moti Ivanir's goal. There are among Beitar Jerusalem long time fans that claim until today that the troubled game was a set-up. Up to them: Avraham Klein is a Maccabi Tel Aviv fan, a good reason for him for setting the score in his favored team. ^ The goals ratio was not clear: Earlier that season Maccbi Haifa Got A Technical win over Shimshon Tel Aviv after a referee was hit by a half eaten apple that was thrown from the crowd. Shimshon was to be blamed about it. So It is not remembered well if A draw of Beitar could even the standings of 1–2 places, or being 1st or 2nd. ^ The quartermaster of Beitar Meir Harush became famous in Greek media at that evening: Beitar Jerusalem whole team flew directly from Italy to Greece to play vs. PAOK in UEFA Cup tournament. Local media heard about Beitar's newly winning and when Meir Harush came out of the airplane, carrying the trophy he was immediately surrounded by photographers. It was told that somebody in Greece said that Beitar Jerusalem should be regarded as a serious team. ^ The news about the bank account were known from the media but most of the fans knew the number after the account was closed and the money collected. The writer of these lines knew the number years later from the book "I love you Beitar". ^ When the writer of these lines bragged for that prize in a Beitar's fans internet forum he was answered by a question: "What are you proud of? The DVD?! The reason for ending in the 9th place without a red card and only 71 yellow cards is that Beitar's players did not fight..."
^ The editor of these news knew it for about an hour earlier, when he got in the midst of a TV broadcast a phone call from his father: "Congratulations !" and asked about the reason for the announcement in the news, he was answered shortly. ^ a b Sorek, Tamir. "The right-wing origins of the Jerusalem soccer team that wants to add 'Trump' to its name". The Conversation. Retrieved 2018-05-29. ^ "Betar's Russian revolution". The Jerusalem Post | JPost.com. Retrieved 2018-05-29. ^ Many of these additions are based on the book in (Hebrew): אני אוהב אותך בית"ר תולדות בית"ר ירושלים, Literally: "I love you Beitar The history of Beitar Jerusalem". The description of the club founding comes before the mentioning outbreak of the Arab revolt of 1936–1939, which occurred on 19 April 1936. ^ (Hebrew): אני אוהב אותך בית"ר תולדות בית"ר ירושלים, Literally: "I love you Beitar The history of Beitar Jerusalem", p. 20. ^ Source: "I Love You Beitar...", page: 272. ^ "Betar broken as new owners back out". Retrieved 30 March 2018. ^ "Owner Vows To Sell 'Racist' Jerusalem Soccer Team After Violence". Retrieved 30 March 2018. ^ a b "Episode 11". E:60. Season 6. 6 November 2012. ESPN. ^ a b "Israeli club paying price for racist fans". FOXSports.com. Microsoft. 19 January 2012. Retrieved 6 November 2012. ^ "Viktor Pacha". footballdatabase.eu. Retrieved 30 March 2018. ^ Boker, Moshe (30 March 2018). "Beitar Jerusalem to Sign Two Muslim Players Despite Fans Protests". Retrieved 30 March 2018 – via Haaretz. ^ Sterman, Adiv (2013-02-06). "Israeli Attorney General pledges to eradicate racism from sports fields". The Times of Israel. Retrieved 2018-05-18. ^ on 10 November 2013 both Matan Navon and Evyatar Yosef were convicted and imprisoned. Source in Hebrew: http://www.mivzaklive.co.il/archives/78865 Archived 22 February 2014 at the Wayback Machine. ^ "Raising hell over Israel's holy days: Ultra-orthodox Jews are pushing hard to keep Saturdays sacred". The Economist. 17 September 2015. Retrieved 20 September 2015. ^ Gittings, Paul (8 February 2013). "Israeli football club torched after signing Muslim players". CNN. Retrieved 13 February 2013. ^ Dawber, Alistair; Walker, Shaun (4 March 2013). "'It's not racism. The Muslim players just shouldn't be here': Beitar Jerusalem fans walk out over signing of two Muslim Chechen players". The Independent. Retrieved 30 August 2014. ^ "UEFA rankings for club competitions". Retrieved 17 July 2018. Wikimedia Commons has media related to Beitar Jerusalem FC.